Unlike human patients, zoo animals and wildlife can't ask for help. They can't tell us where it hurts. They can't describe their pain and discomfort. And they have natural instincts to hide symptoms of distress. For hundreds of years and at a snail's pace, scientists have been on the trail, so to speak, of uncovering those symptoms and trying to improve the quality of life of zoo animals and wildlife all over the world. But why is it taking so long to figure out these ailments and get solutions? Like any scientific dilemma, it takes time and money to get answers. Fortunately, there have been pioneers in zoological medicine who have opened the door, and research studies are underway making advancements to help keep zoo animals and wildlife on our planet. But the fact is, saving people, domestic animals, and the earth has rightfully overshadowed the focus on zoo animal health. 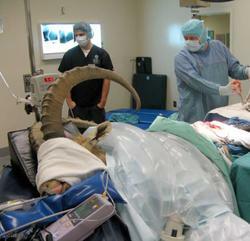 Zoo and wildlife veterinarians work with all kinds of animals and know when something's wrong. It's an awful feeling not knowing the best way to cure an infection, treat an illness or disease, or soothe an animal in distress. As a result, zoo and wildlife veterinarians have taken it upon themselves to start the Wild Animal Health Fund. By solving the unknowns, zoo and wildlife veterinarians have better chances of eliminating diseases, finding cures and advancing techniques to give these animals live long, healthy lives on our precious planet. Click Donate to support more discoveries! Below is a list of the six challenges zoo and wildlife veterinarians face every day. Some are big and some are small but they can all stand in their way as they try to make animals' lives better. There is a deficit of knowledge in disease development in zoo animals and wildlife. Zoo veterinarians base the treatment of diseases on experiences in similar domestic animals. Many animals will not cooperate with external devices of any sort. Accessibility problems and animal stress factors make the delivery of medications extremely challenging. Non-domestic species metabolize medicine very differently, and appropriate drug dosages are yet available. In-country circumstances limit assessing health and disease in free-ranging populations. Diseases move through an ecosystem in a very complicated fashion. Animals can't ask for help. That's why we're here. The Wild Animal Health Fund advocates for the injured, sick and dying animals all around the world. With your help, we can make a difference. We want to keep you informed. Enter your name and email address below.